Here are some common questions about climbing Kilimanjaro. I am focusing on the Machame route because I climbed it and it is one of the most popular. This was one of my Memories are Everything® expeditions. Since I am not a guide nor a professional climber, this information is based on my experience and are my opinions so always consult with a professional before making any serious climbing decisions! A: Kilimanjaro is located in Tanzania, Africa. It is unique not only for being the highest in Africa and one of the 7 summits but for having one of the highest stand-alone vertical gains of any mountain earth. It stands seemingly alone in the Tanzanian savannah. Most climbers fly into Kilimanjaro airport and take a cab or bus to Moshi, Tanzania to meet up with their team or guide service. View Kilimanjaro on a larger map. A: Being near the equator, it can be climbed most anytime of the year however the biggest consideration is the rainy season in the winter so summer is most popular with September being the prime month. Q: I read that Kilimanjaro is an easy climb, really just a high-altitude hike. How hard is it? A: If you are in great aerobic shape, it can be "easy" on a perfect weather day and on the normal routes. But as with most of the extreme altitude climbs, Kilimanjaro can have brutal summit weather with temperatures at 0F and if the winds are blowing, the wind chills can be very dangerous. Climbers die on KIlimanjaro. Also, remember this is almost 6,000 meters, 20,000 feet so AMS is always a risk as is HAPE or HACE. Q: How does the normal routes on Kilimanjaro compare with Denali since it is at a similar altitude or Rainier? A: Kili is a straightforward climb via the normal routes with no real objective danger except for cold summit weather. Porters carry everything for you, as required by the park regulations, so all you carry is a simple day pack with the bare essentials. On Kilimanjaro, it is very dry and there is rarely snow down low but some snow on the summit. There is no crevasse danger like on Denali or Rainier on the normal routes. It more similar to a tough Colorado 14er than Rainier or Denali. Q: Is an Kilimanjaro climb dangerous? A: Kilimanjaro is a relatively safe climb by the standard routes. However, there are always deaths on these big mountains. Kilimanjaro is no different. The most common cause of death is probably altitude related and that is from going too fast and not taking the time to acclimatize. This is why selecting the proper guide service is critical. A: This was part of my 7 Summits Climb for Alzheimer's: Memories Are Everything® project. So I had climbed almost continuously throughout 2010 and 2011 either in training or on the climbs. I was in excellent condition both the physically and mentally for this climb. But I suggest the usual training regime of running, light weight and aerobic conditioning. Pl ease see my training page for more ideas. A: Yes! Anytime you are above 8,000' you can experience problems. Kilimanjaro is a serious high altitude mountain. Even though the normal routes are not technically difficult, the altitude takes it toll on climbers each year thus the 66% success rate. We had several members of our team struggle (including vomiting) with the altitude on the summit push but everyone pushed through and we had 100% success. A: Mostly I use the same gear I used on Rainier. Lot's of layers. It is always critical to protect my toes, fingers and face since these are most susceptible to frost bite. As for warmth, I always wear a knit cap and at least liner gloves when I get the least bit cool - regardless of the outside temp. I used simple trekking pants and top for the lower levels but got serious for summit night. I use a 3 layer system of Merino wool base layer (top and bottom) then my Patagonia Guide pants. On top I had my base layer, Patagonia Hoody as a mid layer then my top wind or warmth layer e.g. Patagonia Micro Puff. When it got windy, I added my rain shell, the Patagonia Rain Shadow jacket. See my gear page for a complete discussion and my gear list updated for 2013. I am very pleased with all my gear but had a few standouts that I note on my gear page. This a video about the gear I used. 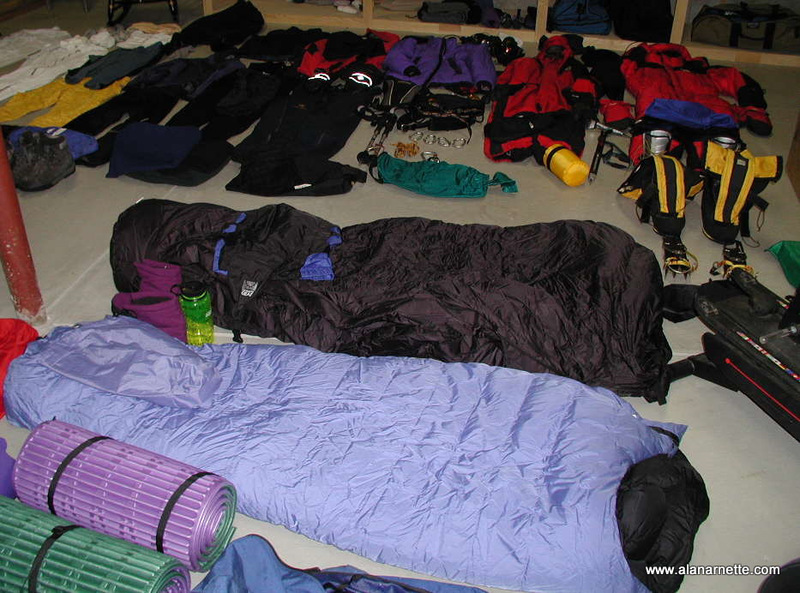 Q: Anything special in your gear for Kilimanjaro? A: It rained so I was glad I brought my 100% waterproof layers of the Patagonia Rain Shadow jacket and pants. Also I used my gators. A rain cover for my pack was very useful. Some people bring an umbrella. A: I posted dispatches on this site at using a satellite phone. Q: How did the Sat Phone work? A: I used Iridium and it was fine for voice and data unless it was raining then it was frustrating in that I lost the signal every five minutes preventing me from uploading multiple pictures. Also, the constant cloud cover prevented me from using my solar charger fully. For details on my expedition communications, please see this tutorial. A: There are 5 main routes that meander from the jungle through five microclimates to join the three final ascent routes to Kibo. Both the Machame and Lemosho routes offer a more leisurely paced scenic climb. The Lemosho route is less crowded while the Machame route has a more difficult beginning but joins into the same route as the Lemosho. The Marangu climb is crowded since it follows a road part way. There is a technical route, the Western Breach, but is is prone to rock fall and is considered extremely dangerous and not offered by most companies unless you are willing to take the risks. A: My entire trip took about 14 days, home to home, including a short safari (highly recommenced) after the climb. The actual time on Kilimanjaro was only 7 days. A: The costs can range from $1500 to $7000 depending on who you use. You must use a guide due to Tanzanian government regulations. See my Guide page for more details. A: Yes you must have permit and all climbers, regardless of route or guides, must use a guide and porters, no exceptions. Q: Do I really need a guide for Kilimanjaro? A: As mentioned, the park service requires guides and porters but they vary in skill as you would expect. The worst one rush clients to the summit to squeeze in more customers throughout the season. But the vast majority are well versed in AMS and take their time. But with local guides, if you get sick, they may not know what to do other than drag you lower. For more serious injuries, your life could be in danger so choose carefully. There is no helicopter evacuation on Kilimanjaro unless dire circumstances. You must bring a two-way radio and a sat phone in my opinion and have the frequency or number of the local rescue resources already programmed in. Q: Are there local guides for Kilimanjaro? A: Yes, there are many quality choices based out of Moshi. and Arusha. Most are less expensive than traditional Western companies but some charge about the same price. My usual advice is to get recent references from a climber with a similar background and skill level as yourself. Get everything in writing. 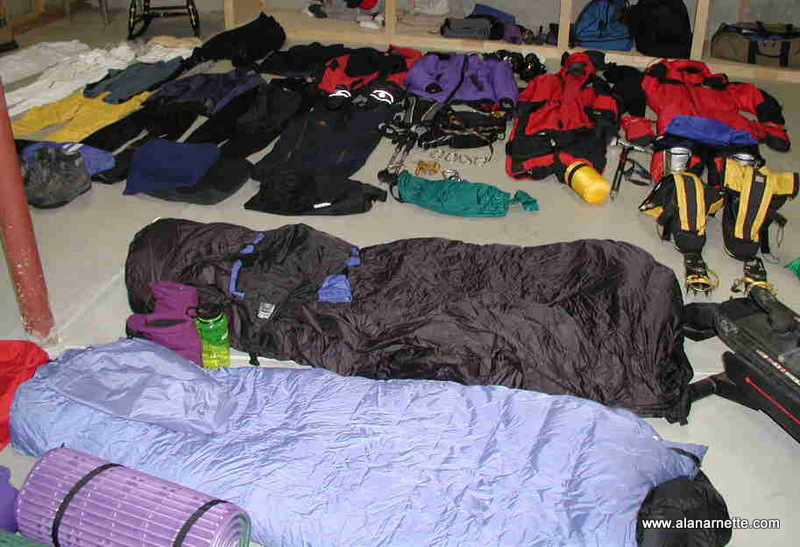 Especially understand the acclimatization schedule since local guides have been known to rush people up and down. Finally ask about food, group gear and language skills. Q: How do you get on an expedition to climb Kilimanjaro? A: Yes. We left the High Camp around midnight and summited about dawn or 7:00AM climbing at a very slow and steady pace. All 14 of our team made the summit, 100%. Q: Why did you choose International Mountain Guides? A: Phil Ershler and Eric Simonson is the simple answer. Phil and Eric have been guiding on Kilimanjaro since the 1980's. Also I was climbing most of the 7 Summits with IMG throughout 2011. As I was going through my injury, I thought about what would have happened with a local guide service with no western leadership. Perhaps it would have been fine but I felt well cared for going through my ordeal having an IMG by my side at all times. A: Very, very well. Eben Reckord was our IMG guide and he showed his experience and skills throughout the climb. We had a variety of skills on our team and Eben was careful to look after everyone with a 100% summit success rate of 14 clients. Q: I understand you were injured on the descent. What happened? A: I twisted my right ankle just below the Barufu camp at 15,000' as we were descending from our summit. It was very painful and extremely swollen so much so that I could not walk on my own. Under the leadership of Eben, the local guides and porters hand carried me down almost 9,000' in a modified gurney on a single wheel. It was an amazing feat of physical strength and determination. I went to the hospital in Moshi where I had good care from the doctors. An x-ray determined no broken bones and I was released. It healed after a few days and I am eternally grateful to Eben, IMG and the porters for looking after me. A: We climbed the Machame route that starts in the jungle and goes through five microclimates to the summit. The trail was mostly smooth and well worn. There was a bit of mud in the beginning so I appreciated having gators. The most interesting or difficult section depending on your experience was on the Baranco Wall where we did some moderate rock scrambling, otherwise the entire route to the summit and down was very straightforward and similar to a Colorado 14er. A: Seeing the famous Kilimanjaro sign was exciting. The summit is extremely large as it is basically the crater of the volcano. You step on the crater rim at Stella point but the high point is marked with a sign a bit further along the crater rim taking from 15 to 30 minutes to get there. There is another spot reported to be 5 feet higher than the sign marked with a weird iron cross matrix just beyond the sign. Along with Eben and teammate Brook, we went there just to be sure we tagged it. Also, the glaciers were inspiring even though it was clear they were melting rapidly. A: It took about 7 hours to reach the summit at a very steady pace and 2 to get back to Barufu camp at 15,000'. I spent 1.5 hours on the summit for an 11 hours roundtrip. A: My mid September 2011 climb was warm and rainy. It was very warm during the first few days then it gradually got colder we gained altitude. The summit bid temps were mild being about 40F leaving camp at midnight and around 32F on the summit at dawn. There was no wind. It rained on our first morning and again on days 2 and 3 including heavy fog and low clouds that blocked most of the good views. Q: Would you climb Kilimanjaro again? A: Maybe. The climb was interesting but not very challenging. It was being in Africa that made Kilimanjaro interesting. I would return for a safari! Kilimanjaro is a nice climb for anyone wanting a combination of cultural experience plus a moderate high altitude climbing experience. The normal routes are pretty safe and do not require technical skills with ropes or crampons. Without snow, it is extremely dirty and dusty. Well worn trails mark the majority of the route. Finally going on a safari after the climb makes the experience all the better.